Founded by the Seventh Nizam of Hyderabad state, Nawab Mir Osman Ali Khan in 1918, Osmania University is the seventh oldest institution of higher learning in India, the third oldest in southern India and the first to be established in the former princely State of Hyderabad. The University College of Engineering has the significance of being the oldest and the biggest in the state of Andhra Pradesh. Established in the year 1929, eleven years after the formation of Osmania University, it was the 6th Engineering College to be recognized in the whole of British India. 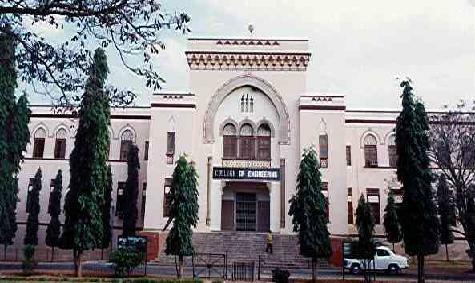 The college was bestowed autonomous status in the academic year 1994-95. The college has also been selected as one of the lead-institutions in the country (under Technical Quality Improvement Programme (TEQIP) of the Government of India, being funded by World Bank) for refurbishing the Technical Education System in the country and for introducing demand-driven courses and cutting-edge technologies. Osmania has a campus covering an area of about1600 acres (6 km²). The university draws students from all across India as well as from various other countries, making it a home to nearly 300,000 students pursuing their higher studies in its campus, constituent affiliated colleges and district centers, under the able guidance of a faculty and staff number of nearly 5,000. University College of Engineering, OU has 3 Boys Hostels, Kinnera Hostel (ECH-I), Ganga Hostel and Swarnamukhi Hostel (ECH-II), and as for the girls, they can seek admission in the Campus Hostel for Women I & II situated on the campus near the University Administrative Building. Osmania University endows hostel accommodation to over 4500 students hailing from outside of Hyderabad city. There are in total, 14 hostels in the University campus and a separate hostel for the Engineering students that are close to the College of Engineering. There are also 2 separate hostel-complexes with all modem facilities to cater to the needs of the girl students. The hostels boost of spacious rooms and superb dining facilities. A kind of facility normally provided in IITs, the University College of Engineering has fashioned a model facility in the name of Students Activities Centre in the site of the College adjoining to the Sports Complex. Indoor games like caroms, chess, etc., are present as a leisure activity for students to relax during free time apart from issuing few sports magazines. P.V. Narasimha Rao, Scholar , Statesman and former Prime Minister of India. Prof.Mohammed Abdur Rahman Khan, Educator, Scientist, Principal of Osmania University College and Nizam College. Barrister Asaduddin Owaisi, Politician and Current Member of Parliament of India. Raj Vemulapalli, MS Computer Science, B.E Computer Science, Senior Director of Engineering, Yahoo! Inc.